Guess what blogosphere?! I might get a real big girl job?! And I might get it real soon. And yes, I know I shouldn’t call this possibility of a job a “real big girl job” at the risk of sounding like everything I’ve done up to this present moment has not been real or big or a job because it totally has been. I’ve worked part-time as a waitress for as long as I can remember. I’ve worked on and off as a part-time office helper turned kind-of, sort-of office administrator for a little over a year. And most importantly, I’ve worked as a farmer. And farming is not easy. Farming is a real job. It is full of all the things careers are typically made of: hard work, dedication, determination, brains, sacrifices, long hours, etc, etc. May I repeat, farming is a real job. And a damned hard, underpaid one at that. But farming doesn’t have some of the things I think of when I say “real big girl job” like regular 9-5 work hours or coworkers who aren’t your husband or vacation time dictated by anyone other than yourself or… a salary. So when I say big girl job I don’t mean to insult you current, former or future Lauren (or my incredible, hardworking husband or anyone out there who chooses any type of atypical path). It’s just that I’ve never had one of these 9-5 things before. And it feels strangely grown up and absolutely terrifying. So I’m going to stick with real big girl job until I think of something that sounds better. This all came totally out of the blue mind you—like seriously 100% out of the blue. My brain was not prepared to handle this on the Monday night of my first day back to work in over a week. My brain was already largely full. Phone calls and thoughts about a decision—a decision that needs to be made by Wednesday (Yes, the day after tomorrow. Yes, that Wednesday. )—consumed an evening that was supposed to be spent making superior quality Asian or Cajun food for Mr. Carrot’s brother and not thinking at all. I got off the phone with not an ounce of creativity to my name. No brain power left for the day. And still no idea what Asian or Cajun dish to make for dinner. So I did what any sane person would do in a situation like this. I scratched the vision in my head for the night. I flipped open my most recent issue of bon appetit, to the post-it marked pages, and just went for it. 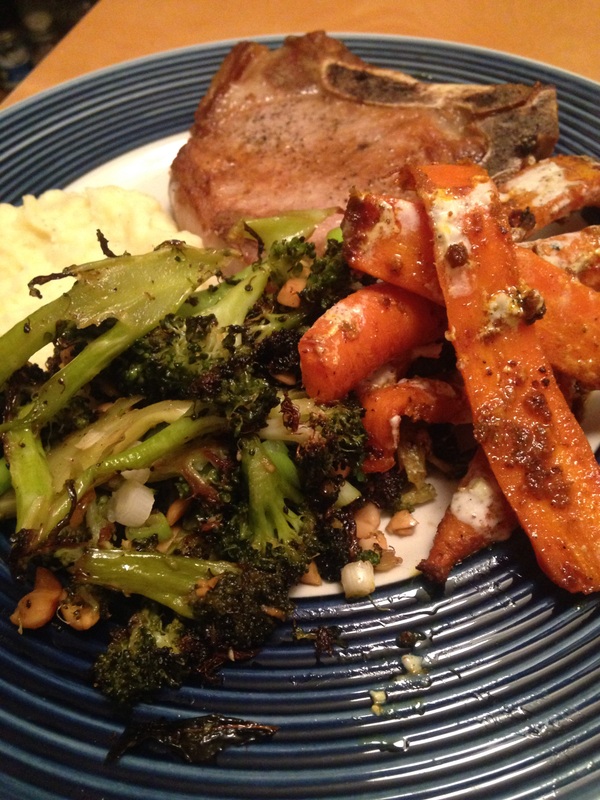 We cooked up three vegetable side dishes with seared pork chops and I attempted my very first pan sauce. Pan sauce 1. Lauren 0. The pan sauce was horrible. But the rest was spectacular. I cooked my troubles away. I ate the most perfectly cooked carrots in the world tonight. And I’ll wait to make a big decision about my future until tomorrow. P.S. Check out my white ceramic asparagus platter!!!! It was a wedding gift and probably one of the coolest things I’ve ever owned. Mr. Carrot says I can’t put a carrot side dish on an asparagus plate but I did. And it’s absolutely gorgeous!!! Preheat oven to 450 degrees. Mix together ¼ cup yogurt, Fox Point seasoning, curry powder, 1 garlic clove, and 3 tablespoons olive oil in a large bowl until smooth. Season well with salt and pepper. Add carrots and toss to coat. Roast on a baking sheet in a single layer, turning occasionally, for 30 minutes. You’ll want them to be lightly charred in spots and very tender. Meanwhile, whisk together lemon juice, remaining garlic clove and remaining ¼ cup yogurt in a small bowl. Season well with salt and pepper. 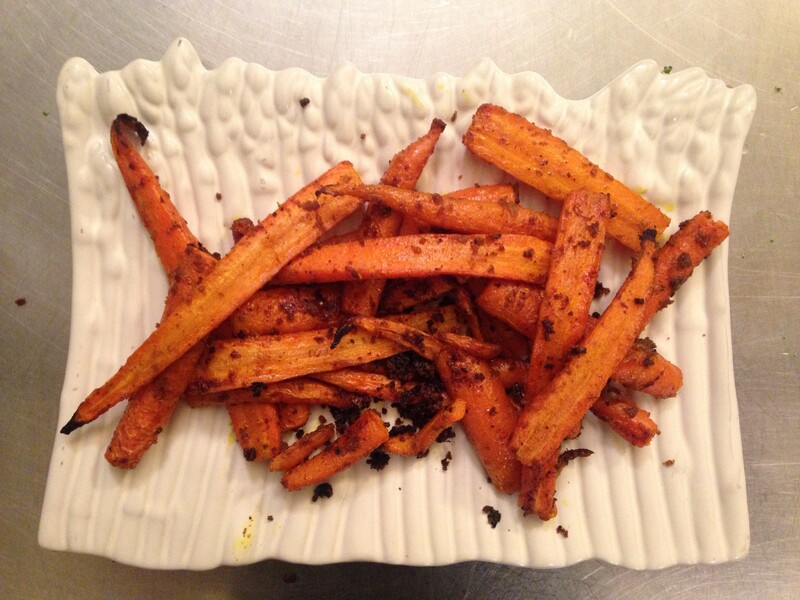 Place cooked carrots on a platter (along with any crunchy bits left on the baking sheet). Drizzle with yogurt mixture. Serve warm. 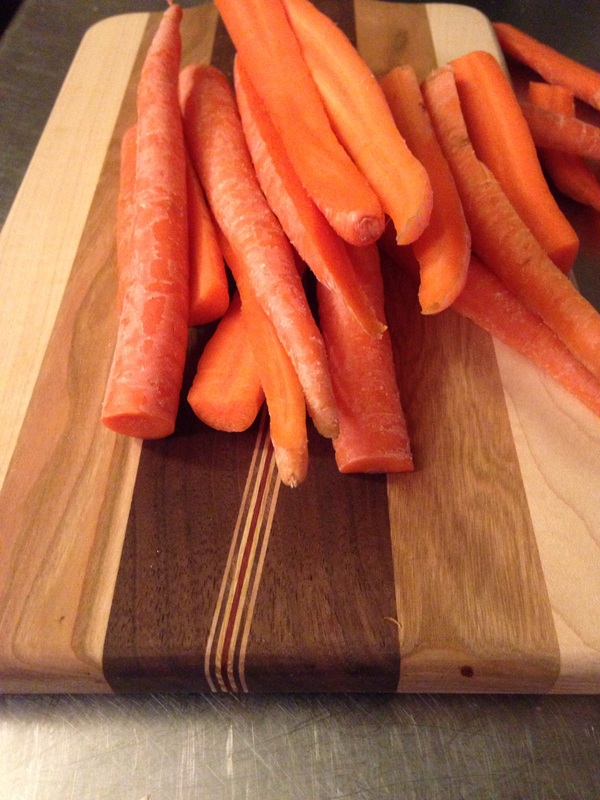 Or skip the platter and put all the carrots and yogurt on one plate and dive in (without sharing!). Previous Post Goodbye Christmas, Hello Work Week. Next Post Big Girl Job.